Last Monday night, my husband and I had dinner with a bunch of "powerful" people. There were 9 of us for dinner, including the two of us. I won't give names because I would hate for someone to Google one of these nice people and end up here on my silly blog, where there is a high likelihood of me saying something that could be embarrassing for someone running for high office. I will just describe it like this: in attendance were three sitting judges, a gentleman who was a member of the Cabinet of two former Presidents, a high level political consultant who served as a senior advisor to Obama in his recent campaign, and our host, the Governor of one of our neighboring states. We dined in a 54 room mansion that was built in the 19th century, surrounded by treasures dripping with historical significance. Initially, I was awe-struck by being in the Governor's Mansion, surrounded by people whose names I had read and whose pictures I had seen. It was one of those "pinching yourself" kind of occasions. Yet, as the evening wore on, I found that the people with whom I was dining were just....well, people. Yes, they had some fascinating stories to tell. Yes, they were incredibly bright and well informed about politics and government. But, they also talked about their grand-kids and their kids. We looked at some funny red spots on their youngest son and did that "mom" thing as we tried to figure out what they were. We talked about teaching teenage daughters to drive and the high cost of sending your kids to college. By the end of the evening, we were laughing and talking like old friends sharing a meal around the table...something I have done many times before with many different people. My primary feeling when I left was "these people are just like me." The next day, I gathered around a different table, with a different group of people. As I do every Tuesday afternoon, I joined with my homeless friends at the Lamb Center for afternoon bible study. The topic I chose for that day was God's strength in our weakness. We began by singing "Jesus Loves Me," a song we all knew by heart. We delved into what scripture says about God's strength and power being "made perfect in our weakness" and shared what those verses meant to us. We explored how difficult it is to admit our weakness and related common struggles that we all have in really surrendering to God's authority, even when we know that His grace is sufficient for whatever we are facing. Two of the gentlemen shared from the heart about how God's grace and strength had gotten them through a time of great darkness and loss in their lives...they had similar stories and one of them was especially encouraged by this brother of his who was further along in his journey of healing. Gathering around that table on that day, I was struck by the holiness of that place. My primary feeling when I left was "these people are just like me." Two vastly different worlds, neither of which I would consider the place where I "live" on a day to day basis. While I can try to offer a helping hand and a listening ear to my homeless friends, I can't truly understand what it must be like to sleep in the woods on a cold night. While I can visit the Governor's mansion, I can only imagine what it is like to live your life in a media fishbowl and have your every move and word analyzed. Yet, in spite of the differences in our daily environment, the things that connect us are so much more meaningful than the things that separate us. Our common humanity, our struggle to make sense of the place where we find ourselves, to find meaning in this journey...these things make us human and draw us together. The people with whom I shared a meal on Monday, the people with whom I shared the Word last Tuesday and again today, each and every one of them are God's beloved creation, made in His image...just like me. The important thing for me to remember is that God loves each of us...my Monday friends AND my Tuesday friends... equally, completely, passionately. As most of you know, we live in the Virginia suburbs of Washington, D.C. From the moment that Barack Obama first announced his candidacy, I told the girls that we would be attending this historic inauguration in person. And Tuesday morning of this week, we were there with close to 2 million of our American brothers and sisters to witness arguably the most significant historical event of my lifetime up close and personally. Because of the unprecedented crowds expected for the inauguration, we moved into Georgetown on Monday night. Friends of ours were kind enough to lend us their lovely home in Georgetown, in spite of the fact that they had been offered BIG money for it! If you don't know, Georgetown is about a 2 mile walk from the National Mall. We got up at 6:00 a.m., quickly dressed in MANY warm layers (picture heading for the ski slopes) and hurriedly headed to the local Starbucks on our way towards the Capitol. As we came out of Starbucks, the soon-to-be President's motorcade sped by us on his way to that morning's prayer service. The closer we got to our destination, the more people we found ourselves walking beside until we were part of a crowd that completely filled the otherwise quiet streets of the city. It was eerie to see the streets of D.C. with absolutely NO car traffic whatsoever! As you can see from the picture, as we entered the Mall area, the sun was just rising. My eyes repeatedly filled with tears as I took in the sights of the many, many joyful people surrounding the historic monuments as we all moved closer to the Capitol. The red hatted volunteers had clearly been instructed to greet the crowds warmly and that they did! As strangers greeted one another, many of us agreed that indeed THIS was going to be a very, very good day. As we walked towards the Capitol, they began to replay Sunday's We Are One concert on the Jumbotrons that lined the Mall. One moment that I found particularly moving was the when the National Anthem began to play from the beginning of that broadcast and the many soldiers who lined the area stopped whatever they had been doing and uniformly took the position that you see in the photo (click on it to make it larger.) In the photo you can also see that there were many, many, many potties on the Mall that day. In fact, we later agreed that there may have actually been more than they needed! As the owner of the smallest bladder in my family, I was very pleased with this decision by the planning committee! We finally decided to stop moving forward when we found ourselves about mid-way down the Mall. For those of you who are familiar with this area, we were between the Smithsonian Castle and the Musuem of Natural History. Although we could see the Capitol building clearly, we could only really see the staging area with binoculars. However, the enormous Jumbotrons lining the expanse that is called the National Mall made it easy to experience the entire ceremony like you were in the front row. When we had picked our spot, we settled down to wait. We had filled the pockets of our ski jackets with newspapers, books, playing cards and snacks. In addition, the girls had each downloaded a movie onto their Ipods. The energy in the crowd was incredible! We met people who had traveled from all over the country to be here for this momentous occasion. People of every race and generation were represented that day and, in spite of the cold, everyone was in a great mood. For those who also enjoy people watching, this was a front row seat to the best show in town. As they began to introduce the dignitaries entering the grandstands, people started to get more and more energized and excited. We were all on our feet by then and would remain on our feet for the rest of the day. I could give you all the details of each moment as it unfolded from there, but I am sure that anyone reading this was watching the whole thing right along with us that morning. It was a series of moments that I will never forget. It is a morning that I hope my children will relish telling their grandchildren about someday. By then, I hope the novelty and import of a person of African-American heritage being sworn in as president of the United States is a common place occurence. I pray so. But this time...this first time...it was a really important, transformational moment in the life of our country. As a person with white skin, I can only imagine and attempt to understand the emotion that I saw on the face of the elderly African-American woman who stood next to me, tears streaming down her face. I would guess that in her lifetime, she experienced first hand the hostility and hatred that builds separate drinking fountains and posts "white only" signs. I don't think we can overestimate the healing that took place to our collective psyche on Tuesday morning when our nation entrusted Barack Obama with the leadership of this country. I just hope and pray that we can take this moment and build on it into the future. After the ceremony was over, we began the much more difficult task of leaving the Mall. Although we were trying to go North and West towards Georgetown, it quickly became apparent that we were only going to be allowed to go South. After a lovely detour by the Jefferson Memorial and then the World War II memorial, we finally found ourselves heading back to Georgetown to warm up and get something to eat. We had no problem driving out of the city and were back at home by 4:30 that afternoon. Obviously, we skipped the parade which lasted well past dark! I have been talking about my support for Barack Obama here on this blog for well over a year. I find him to be an inspirational leader unlike any I have seen, listened to or read about in my lifetime. Based on the sheer enormity of what happened in Washington, D.C. on Tuesday, it appears that I am not alone. Whether you voted for him or not, I believe Americans are joining together in wishing him well and praying for his success. I appreciate that he continually reminds us that this is not about him, but about all of us joining together and believing that we can contribute to our collective well-being. That we all have a responsibilty to be part of the solution. As a Christian, that begins by committing to pray daily for him and his administration as they begin this journey. Will you join me? I'm working out in the basement the other day and I am concurrently watching MSNBC to distract myself from the fact that I am exercising. During one of the many commercial breaks, an ad came on about the plight of the polar bears. You know, a celebrity person speaking dramatically over pictures of precious polar bear cubs frolicking with their precious polar bear mommy. The type of music and the tone of voice of the actress led me to infer that I should be very concerned...in fact, it seemed that the situation was quite dire and required my immediate attention. The very lives of these polar bears was apparently in my hands. At that moment, something occurred to me. In fact, you might even call it an epiphany . It seems I could not work up one ounce of passion or moral outrage for these poor polar bears. Here I am, a good card-carrying, tree-hugging, peace and love swearing liberal and I did NOT care about those poor little polar bears. I mean, look at them; they are adorable. Don't get me wrong. I don't think we should go around randomly slaughtering polar bears. They are some of God's creatures and we should respect them as such. However, the inference of the ad suggested that this was an issue of grave importance and should be treated as a top priority in the allocation of our resources. I just couldn't get that excited about it. If I have $100 and I have to decide how to spend it in saving the world, polar bears are going to be pretty low on my list. Obviously, that is a pretty simplistic assessment of the issue, but you get my point. I personally think we better get busy drilling for oil wherever we need to do so WHILE we are developing alternative fuels; we need to do EVERYTHING we can to end our dependence on foreign oil. So...drill, baby, drill! I both oppose this war AND love and support our soldiers. When I see a person in an armed services uniform, I go up to them, look them in the eye, and personally thank them for their service. I am not willing to give up my SUV as long as I can have the opportunity to stuff 7 teenage girls into the back of my car on the way back from the Homecoming dance and listen to them giggling and talking about the evening. I can afford to pay for the gas. Consider it my part in stimulating the economy. I could care less how much money the RNC spent on Sarah Palin's clothes. I would love to have whoever is dressing her take me shopping....she has been wearing some awesome outfits! Girlfriend, I don't much like your politics, but I applaud your right to look fabulous while you are doing your job as chief name-caller for the Republican party. Fair or not, a woman has to "dress for success" if she is going to be taken seriously as a potential leader of the free world. So, you go girl! Lastly, and much more seriously, I think abortion is one of the saddest symptoms of our "live for the moment, damn the consequences, throw it away" society. It is a heartbreaking decision for a woman to make and noone is "pro-abortion." I am pro-life, in spite of the fact that I don't think criminalizing abortion is the appropriate solution. A consistent ethic of life, in my opinion, also includes issues surrounding hunger, healthcare and the death penalty. So, what is my point? People should not be put in little boxes and labeled . My decision to support Senator Obama's bid for the presidency does not mean that you can check off every box next to some person's definition of the label "liberal" if you are describing who I am. Human beings are much more complicated than any particular label would imply and labels are almost always dismissive, discounting and disrespectful. When I first started blogging, I wrote about the "us vs. them" mentality that is so pervasive in both the political world and, sadly, in the church. That was in 2005 and I'm afraid it hasn't changed much since then. The current name-calling....specifically the labels of "terrorist" and "socialist"...do nothing to raise the level of political discourse. It just gives the media something to talk about. I can't believe that the offensive robo-calls that we have been receiving are winning any votes for the party financing them. I had lunch the other day with 4 of my Christian sisters and, as might be expected, the discussion turned to politics. All 5 of us are planning to vote for Senator Obama, for a variety of reasons. One thing that we all had in common was the experience of having to defend ourselves against the accusation/ question of "how could we call ourselves a Christian and vote for someone who was pro-abortion?" We talked about how we answered that question and why we felt that Senator Obama does represent the best choice, FOR US, in terms of the values that we believe are central to our Christian faith. Each of these women deeply loves Jesus and tries on a daily basis to follow Him. They believe that they are both voting their conscience AND voting as an outpouring and an expression of their faith. It angers me that anyone would question their faith because of their political choices. I applaud their right to make their choices and I applaud John McCain's supporters' right to do the same. I pray that by the next election, Christians will indeed realize that God is not a Republican or a Democrat. God is definitely too big for any label of this world! As I have mentioned before, my husband and I generally cancel out each other's vote. This year will be no different, yet we agree on many more issues than we disagree. He doesn't completely fit the "conservative" label, anymore than I completely live up to the "liberal" label....although we have a good time joking about it. Our voting will be a reflection of our opinions about the most serious issues facing this country and our beliefs about the best approach to solving those problems. In these difficult times, it is important to remember that voting is a great privilege and responsibility. We must vote prayerfully and with a sense of gratitude for the right to do so...a right that many people in this world do not enjoy. Barack Obama is talking this week about steering more federal money towards empowering faith-based organizations that reach out to less privileged communities. In an article about these initiatives, "Obama also talked bluntly about the genesis of his Christian faith in his work as a community organizer in Chicago, and its importance to him now." "In time, I came to see faith as being both a personal commitment to Christ and a commitment to my community; that while I could sit in church and pray all I want, I wouldn't be fulfilling God's will unless I went out and did the Lord's work," he said. I found myself a part of a heated discussion one night while we were in Texas. One of my dear ones and I are, as he says, "polar opposites" in terms of our opinions on a number of issues. While we both come from a similar place in terms of our devotion to our Christian faith, we disagree on pretty much everything else. Gun control, race relations, the health care crisis, patriotism, the war in Iraq, criminal justice system...certainly anything to do with politics or our current presidential candidates...all of these are areas where we...to put it mildly...don't see eye to eye. In an effort to "keep the peace," we successfully avoided these topics for the majority of our visit....the majority anyway. Our last night, things finally got heated. I don't even know which one of us just couldn't let that one last thing go uncontested. Let's assume it was me. It doesn't even matter which topic we finally went head to head on....clearly, both of us were unwilling to let it go this time. I definitely felt strongly about this particular subject. Truth be told, neither of us had any interest in hearing the other person's opinion; we were completely focused on defending our own point of view and proving how "right" we were and how "wrong" the other person was. There was little, if any, real listening going on. By the end of the evening, nothing had been accomplished but hurt feelings. So why would I share this lovely moment...this perfect example of how NOT to behave when visiting loved ones? Because I think our experience was representative of some larger issues within the Body of Christ. Looking back on our discussion within that larger context, I am convinced that I would like to behave differently next time. As I mentioned before, this particular person and I share something very important. This man, whom I love dearly, is my brother in Christ. I have personally been witness to the working of the Holy Spirit in his life and I would hope he would say the same about me. Through that common core identity, the values which we share should, in a perfect world, override those areas where we disagree. Yet, the areas where we disagree, are the very issues which we both believe are impacted by our relationship with Jesus Christ. More simply, WHOSE we are plays a very important part in WHO we are and what we believe. So, if the same Spirit resides in both of us....if the same God reveals His truth to all believers...if we are all reading the same Word of God...then why do we disagree on so many things? What kind of pride, what kind of arrogance does it take to assume that YOUR truth is truer than your brother or sister's truth? Shouldn't we stand up for what we strongly believe in? Yet, if truth is true, then someone has to be wrong, right? First of all, I did not invite God to join me in our conversation the other night. If I had prayed while others were speaking, instead of hurriedly trying to formulate my next response, things might have gone differently. I operated completely in my own power and pursued my own agenda, when I know full well that what I have to say is much more meaningful when I get out of the way and allow the Holy Spirit to guide my heart, my mind and my tongue. I learned a long time ago to ask the Holy Spirit to inhabit the driver's seat when I am involved in conflict. In the heat of the moment, I neglected to center myself in that place of safety. Secondly, I did not really listen. If I had been more concerned with really listening, really hearing the emotion behind the argument, I might have left with a better understanding of why the others felt the way they did, even if I still didn't agree. Ironically enough, I led two discussions on Active Listening Skills right before we went to Texas. I know that real listening means setting aside my agenda and really trying to place myself in the other person's shoes. As often happens in discussions where there are strong feelings involved, I was too busy formulating my own responses to really listen to what anyone else was saying. My goals were not to exchange ideas and learn from one another, but to prove that my opinion was correct. In hindsight, that is not the kind of relationship that I want to have with others. Lastly, I did not find the proper balance recommended in Ephesians 4:15 which says "Instead, we will speak the truth in love, growing in every way more and more like Christ, who is the head of his body, the church." Speak the truth in love. Yes, I felt compelled to speak what I believed to be truth, something I would do again in similar circumstances, but I neglected to speak only out of love. Because of that, I said things that caused hurt feelings. Things that caused more separation, instead of the unity that Christ desires for His people. Jesus never backed away from speaking the truth, but He set an example for us by always doing so in love and by choosing His battles wisely. I was saddened to read this week that the PCUSA, the denomination of which I am a member, has suffered more division within its ranks at their recent GA meeting. Two very different sides, perhaps an irreparable rift in the very identity of the denomination. It may be too late for listening, in that particular case. Yet, as we travel our individual paths, I wonder if we can do a better job of solving our conflicts and settling our disagreements by inviting God to be part of the conversation, really resolving to listen to one another and by only speaking the truth from a place of love and respect. Perhaps that will begin to show us a glimpse of the Kingdom of God that Jesus says is within us. I was so sad to hear the news this afternoon that Tim Russert has died. I have shared here before that I am a big fan of MSNBC political coverage and Tim Russert is, to a large degree, responsible for my loyalty to that network. Beyond his incredible enthusiasm and love for the game of politics, he just always seemed like such a nice guy. I have spent the last half hour or so listening to his colleagues struggle to maintain their composure while they talked about the loss of their friend. They have hardly mentioned what an amazing journalist he was. To a person, they have gone on and on about the kind of father he was to his son, the kind of son he was to his father, the kind of husband he was to his wife. They talked about his faith and how his faith impacted who he was as a person, both personally and professionally. One person even said "he was a great fisherman for his faith." They have talked about the ways that he comforted and supported the people around him as they went through various challenges in their lives. They have talked about the phone calls to check on someone who was sick, the notes to follow up with a friend who was mourning....they talked over and over again about his incredible kindness and love to those with whom he shared his journey. My prayers and thoughts are with his family and friends and colleagues this evening. I can't believe he won't be here to finish out this election with us. You will be missed, Mr. Russert. I just posted pictures originally, but figured that I better go back and give a little more information about our trip to the Obama Rally at Nissan Pavilion on Thursday. It was a hot day, but we were fired up and ready to fight the crowds. I attended the rally with one of my best friends, her 14 year old son and my youngest daughter. My older daughter had a dress rehearsal for this weekend's dance recital, so she unfortunately was not able to go with us. My husband....well, he is a....well, how do I say this....he is actually a Republican :-) All joking aside, my husband really pushed baby girl and I to attend...witness to history, always remember this experience, etc. So, I pulled her out of school early and we fought the crowds to be part of the 10,000 others who felt compelled to hear Obama speak in person. In addition to Senator Obama, we had the opportunity to hear from VA Governor Tim Kaine and VA Senator Jim Webb.....both, by the way, being discussed as potential VP candidates. I have long admired Tim Kaine for his ability to articulate the ways that his faith informs his politics. Senator Webb is also a very smart man, while a bit a cerebral in his speaking style, and he had the privilege of introducing Senator Obama to a wildly enthusiastic crowd. We arrived just as the parking lot opened at 2:00, stood in line with our fellow Obama-ites until 3:00, then waited comfortably seated until the first speaker went on at 5:00. At 5:45, Senator Webb took the stage with Senator Obama. After a rousing introduction, Senator Obama took over the mic at 6:00. The most powerful part of being there was standing side by side with the 10,000 other people. There were many, many children there....all young witnesses to history, all taking an early interest in the peaceful process of transferring power in our country. While it was powerful for my daughter to be there, I was particularly moved by the large number of African-American families there with their children. As I said in my last post, I have to believe that my emotional reaction to the certainty of Senator Obama's nomination is doubled within the spirits of my African-American brothers and sisters. I have to believe that my pride in sharing this historic event with my daughter was nothing compared to the experience of the elderly gentlemen in the hat that identified him as a World War II veteran....an African-American man who had certainly grown up in a very different world than the world that these children were experiencing as they watched this dynamic man inspire a crowd of many colors. Perhaps one day, it won't matter that Senator Obama is a man of color....perhaps one day, we won't even notice. For now, I think it is right to notice and to celebrate....until we finally don't have to talk about it anymore at all. Lastly, I was impressed once again by Senator Obama's commitment to make this a different kind of campaign. He stood there in front of 10,000 people and promised to not allow this to be a campaign of "politics as usual." He recounted a conversation with John McCain where they had agreed to a substantive debate on the issues. While I support Senator Obama, I have long been a fan of John McCain's independent spirit and willingness to think outside the box politically. I admire both of these men for their willingness to work across the aisles and to refrain from villifying the other party. I am excited and hopeful about this campaign between two honorable men. We'll see if that hope is based in reality! Last night marked an historic moment in American politics, perhaps in all of American history. An African-American has been nominated by a major party as their nominee for President of the United States of America. I don't know, but I have to believe that young men and women of color have to see their opportunities as citizens of this country a little differently this morning. I also have to believe that African-Americans who lived through the tumult and sacrifice of the civil rights movement feel some validation at what they have symbolically achieved through Senator Obama's journey to this place in time. As you know, if you have ever read this blog before, I am an enthusiastic supporter of Senator Obama and his politics of unity and hope. I was impressed by his words last night, particularly when he expressed his humility at being placed in this position and his continued commitment to rise above the politics of division and separation. I believe he defied the odds and clinched this nomination because people are tired of the ugliness of the status quo and want to believe that someone is capable of doing this thing we call public service in a different way. I pray fervently that we have invested our votes wisely and that our optimism will be rewarded by real change. I plan to take one of my kids to hear Senator Obama speak here in our area tomorrow, so stay tuned! As we mark the 40th anniversary of Dr. King's assassination today, it seems appropriate to celebrate the legacy of his life's work. Dr. King was a powerful speaker and his words inspired a generation of Americans to dream bigger dreams about the future of ALL of our children, regardless of the color of their skin. 40 years after a gunman attempted to silence Dr. King's voice, we once again are debating whether leadership can be measured by the power of inspiring, visionary words. Are they just words? Is there power in those words that can be translated into real change? Watch this 13 minute video and see the impact that Senator Obama's movement for change is having on a group of teenagers in the Bronx. Regardless of your politics, you will be moved by the impact that the election is having on this group of kids. I haven't written in a very long time....spring break, busy life. And I'm not going to write much today. I just wanted to share what I thought was a very perceptive and honest remark made by Mike Huckabee regarding Reverend Wright. As easy as it is for those of us who are white to look back and say, "That's a terrible statement," I grew up in a very segregated South, and I think that you have to cut some slack. And I'm going to be probably the only conservative in America who's going to say something like this, but I'm just telling you: We've got to cut some slack to people who grew up being called names, being told, "You have to sit in the balcony when you go to the movie. You have to go to the back door to go into the restaurant. And you can't sit out there with everyone else. There's a separate waiting room in the doctor's office. Here's where you sit on the bus." And you know what? Sometimes people do have a chip on their shoulder and resentment. And you have to just say, I probably would too. I probably would too. In fact, I may have had ... more of a chip on my shoulder had it been me. - Mike Huckabee, offering his perspective on the preaching of Rev. Jeremiah Wright. I was out of town when most of this hit the airwaves and had to catch up when I returned home to my TV and computer. I had the opportunity, like many of you, to catch Senator Obama's historic speech about race in response to these issues on YouTube. I have to say that I have never heard a more honest, more inspiring, more convicting, more deeply TRUE speech in my lifetime. As one pundit said, he talks to us like we are adults. If you haven't listened to it in its entirety, you have missed out. I encourage you to take the 35 minutes it takes to listen. Click here if you would prefer to read the transcript of the speech. Quick update on my fuzzy brain before we talk about politics. Praise God, I am SO much better! I took the last dose of the devil medicine on Sunday evening. As soon as I started decreasing the dosage last week, I saw immediate improvement. With God's help, through some wonderful suggestions of a friend, I also found a way to deal with the ongoing dizziness, nausea, etc. that went along with the "detoxing" process. While I can still feel some residual effects, I am 90% back to normal. Feeling horrible for a month really makes you appreciate feeling good, and I am indeed grateful. Thank you to all of you who asked me how I was doing and told me that you were praying for me. God has used many of you to wrap me in His arms and remind me that I am loved and that He is on my side. Watch out though, as the fog has lifted, my family has been laughing at my comparative giddiness and energy level! I'm back! Enough of that....how about my man Obama last night?!?!?! Because of some ugly weather last night, the rehearsal that I was supposed to attend was cancelled and I got to spend 4 + hours watching election coverage on MSNBC last night! I was in heaven! Because I love all of this so much and because I couldn't read very well for several weeks, I have watched A LOT of coverage of this primary process and I feel like all the gang at MSNBC are my pals. It cracks me up to see them fall all over themselves about the exit polls after the polls close on these primary/ caucus nights. Have you ever been part of an exit poll? Have you ever seen anyone asking questions for the famed exit polls? I want to be in an exit poll!!! It was a privilege and an honor to go vote yesterday morning. I got tears in my eyes as I stood in line at my daughter's middle school to wait my turn to vote. I have never paid that much attention to the primaries before and, living in Virginia, my vote as a Democrat has never really amounted to much more than a symbolic act of my rights before now. I was humbled by the realization that much of the world does not have the right to engage in the process of choosing their leaders. Whatever happens in the coming months, this process is still honorable and it matters that we participate. It mattered that I got to finally say "Yes We Can" with my vote. I watched Senator Obama speak last night. He was in Wisconsin, campaigning for the race there next week. As always, I was moved by his eloquence and his insistence that we not give in to cynicism. He said "cynicism is a weak kind of wisdom." The definition for cynicism is this: "an attitude of scornful or jaded negativity, especially a general distrust of the integrity or professed motives of others." Isn't that exactly how many people have come to feel about politicians? Isn't that indeed how many of us have come to feel about our government? Cynicism is not my natural state. My DNA leans more towards optimism and hope...a "glass half full" view of the world. Yet, years of watching how special interests and lobbyists have ruled Washington, D.C. can darken even the rosiest colored glasses. Senator Obama, it seems to me, offers us a different choice. By refusing to take money from political action committees and lobbyists, by refusing to engage in the politics of negativity and personal attacks, by releasing his personal tax returns and being transparent about who he is, he is rising above politics as usual. His brand of hope based on raising our expectations, and dreams realized through hard work and opportunity resonate with me and apparently, with many others. He is a visionary leader, with a unique ability to communicate his vision for change and motivate others to participate in the process. Can you tell that I am fired up? Perhaps I love Senator Obama so much because he gives me an excuse to set aside the cynicism that feels so against my nature. Perhaps we are, as one friend suggested, "being over-promised." Perhaps all of us who choose to suspend our cynicism and believe that change might really be possible after all will just look like fools in the end. Naive, trusting lemmings following a charismatic charlatan down the yellow brick road of false hope and unattainable dreams. Dreams of a government where the two parties treat one another with respect as they debate and problem-solve their way to creative solutions and bigger ideas. Dreams of a leader who, instead of villifying those who disagree with him, chooses to listen. Dreams of a government who, as John Edwards continues to remind us, hears the voices of those amongst us who have the least and need the most. Big dreams requiring much hard work and exceptional leadership. Today, I am choosing to go ahead and suspend my cynicism and take the risk of looking the fool for buying what Senator Obama is selling. I choose not to settle for the status quo. I choose to believe that we can do better. I am excited about this election and I look forward to volunteering for the campaign once Footloose is over (I'll update you on that in a future post.) I would love to hear what others think. All opinions are welcome here! This video was taken from an appearance right here in Virginia yesterday. A woman in the audience asks him why she should vote for him instead of Hilary in the Virginia primary on February 12th (tomorrow.) I liked his answer. See what you think. However you vote, if you live in Virginia, D.C. or Maryland, go vote tomorrow!! Just received notification from the Obama campaign about the posting of this new video...very cool! This is one of the reasons he is reaching so many young people. The messages of hope and inspiration expressed here, as well as the invitation to become part of the solution, appeal to many who have never felt compelled to get involved before now. It is very creative. Take a look! Whatever you think of Obama's politics, you must admit that he is the most compelling speaker that we have seen in many, many years. This video was done by one of his supporters and was taken from his speech the night of the New Hampshire primary. I dare you...see if you don't feel a tiny bit less cynical after you watch this...even if just for one hopeful moment. As some of you are very much aware, I have been a huge Barack Obama fan ever since he first made his way onto the national stage at the Democratic National Convention in 2004. I have read (most of) his two books and I get emails from his campaign pretty much every day. I was thrilled with his first win yesterday in Iowa. I am excited to see what happens next. I look forward to voting in our primary on February 12th. Senator Obama has even been mentioned on this very blog, for instance, here, here, and here. There are a couple of things that make Senator Obama's win particularly compelling for me. First of all, it is reported that yesterday in Iowa about 57 percent of voters under 29 years old voted for Obama and they represented 22 percent of the total vote. In recent years, young people have been increasingly cynical about politics and have stayed away. It is exciting, in my opinion, to see the twenty-somethings get excited about a candidate. As my friend Nancy said, when she emailed me this morning in celebration, "optimism is back in fashion." The other aspect of this win that I feel compelled to celebrate is the issue of race. As one reporter phrased it "Democrat Barack Obama has put to rest the question of whether a black presidential candidate can win in white America." With his win in 95% white Iowa, we have seen demonstrated that politics are, perhaps, becoming more color-blind. Perhaps that statement is naive to the extreme, but as my friend Nancy says...optimism is back in fashion. ANYWAY, I digress....I find Gov. Huckabee interesting because some of his detractors in the Republican party have called him a "Christian Socialist." The reason for this name-calling is because of the way his faith impacts his views on our responsibility to the poor and disenfranchised in our society. It appears that he, like many of us, has noticed that Jesus talks a great deal about the poor. Further, the way he interprets those teachings has caused him to break with many in his party on a number of social issues. As one reporter said about his time as governor of Arkansas, "they discovered that Huckabee's 'do unto others' world view also led him to push for more money for schools and a health-care program for poor children that became a model for other states." Don't get me wrong; this candidate has many of the conservative views with which I disagree. However, I am left wondering how a preacher who has been out-spent by such a huge margin has emerged a winner in this first battle. What is about him that appealed to the voters in Iowa? I really enjoyed this quote I saw in the Newsweek article, "I'm a conservative, but I'm not mad at anybody about it." Perhaps that it a part of his appeal. Once again, a message of hope, optimism and change. Prior to the week I picked up that Newsweek, I hadn't heard much about him. I will be interested to see if his candidacy continues to gather steam as the process continues. In the meantime, I will just enjoy the fact that he, like another famous politician, comes from a town called "Hope." Senator Obama sent me a little personal message today (me and a few million other interested people!) Thought you might enjoy hearing what he had to say! 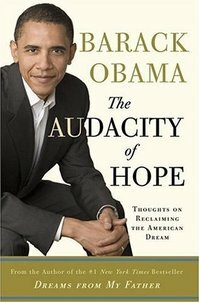 I am reading Senator Obama's two books right now. He is an eloquent writer, as well as a gifted speaker. I am enjoying the opportunity to learn more about the journey that has brought him to this moment in history. Whatever happens in the election, he is a dynamic leader who speaks clearly about values that many of us share. Regardless of your politics, you might enjoy the following video that tells a little more about this rising political star. I spent over 10 years working in the substance abuse field. I have also attended my fair share of Alanon meetings. One of the absolute mantras of recovery is "never work harder on the problem than the person with the problem." Doing so, that is "working harder than the person with the problem" is a recipe for disaster...a sure way to stay stuck in the dysfunctional pattern that is making you miserable. The "person with the problem" has no incentive to get better; you continue to build resentment and frustration...and nothing changes. It seems to me that is exactly what we are doing in Iraq. We are working harder than the person with the problem. Consequently, there is no reason for the Iraqis to make any changes. In this instance, however, the consequences are more serious than resentment and frustration. Over 3,000 of our brave young and men have died, thousands more have been horribly wounded. Now we are sending more troops into harm's way. It makes me so sad. I listened hopefully to the President the other night. I prayed for him as he spoke. I was hopeful that he would lay down some firm boundaries for the Iraqi people. Perhaps he did to some degree. What I didn't hear was what would happen if the Iraqis don't do their part. Sticking with my previous analogy, any intervention should include the following: here is the problem, here is what you need to do, here is what we will do, AND here is what will happen if you don't do your part. The last part is the muscle, the "change-maker" and, it seems to me, that is the part that is missing. Unfortunately, we are gambling the lives of our brave young men and women that the Iraqis care as much about change as we do. I think this speech given last night by this president represents the most dangerous foreign policy blunder in this country since Vietnam if it's carried out. The time for more U.S. troops in Iraq has passed. We do not have more troops to send and, even if we did, they would not bring a resolution to Iraq. Militaries are built to fight and win wars, not bind together failing nations. We are once again learning a very hard lesson in foreign affairs: America cannot impose a democracy on any nation -- regardless of our noble purpose. We have misunderstood, misread, misplanned and mismanaged our honorable intentions in Iraq with an arrogant self-delusion reminiscent of Vietnam. Honorable intentions are not policies and plans. Iraq belongs to the 25 million Iraqis who live there. They will decide their fate and form of government. Do the Iraqis even want democracy? Are they willing to fight for it...to die for it? I just don't know. I just know we need to make a decision about how long we are willing to work harder on the problem than the people with the problem. Seems like everyone in the country except George Bush, bless his heart, is already done. I am really proud of our president today. I had the privilege of watching President Bush's press conference at noon today; moments before, the news had broken that Defense Secretary Rumsfeld was out and Robert Gates was named to replace him. President Bush spoke of the need for a "fresh perspective" on the war in Iraq...a fresh set of eyes. He spoke of listening to the voices of the American people and hearing the frustration expressed in our votes yesterday. He joked that the Republicans had taken a "thumpin." I sensed a new humility amidst his characteristic firm resolve...maybe I'm just being optimistic. I liked what he had to say and how he said it. We are blessed to live in a nation where this type of shift in the balance of power can take place so peacefully. While the ads sometimes got a little nasty, no blood was shed...noone was killed. The American people spoke and, at least for today, our leaders heard us and acted on our concerns. Democracy in action. Ooooooh! This is fun! All day coverage of election day! As Tim Russert said this morning, little white board in hand, "it's going to be a long night!" "Rumsfeld has lost credibility with the uniformed leadership, with the troops, with Congress and with the public at large," the editorial states. "His strategy has failed, and his ability to lead is compromised. And although the blame for our failures in Iraq rests with the secretary, it will be the troops who bear its brunt." White House spokesman Tony Snow said the president was told about the editorial, and his reaction was to "shrug it off." Arrogance, hubris, denial...I'm not sure. For months, we have been listening to the politicians...today, it is our day to make our voices heard. My favorite Republican, the one with whom I share a bed, once said in a mixed group of Republican and Democrats, "I keep thinking YOU Democrats are going to do something about him (meaning President Bush.)" Well, the Democrats just may get that chance...to hold this administration accountable, to offer a better alternative than the strategies (or lack there of) that we have been criticizing, to re-focus our priorities and get to work on the issues that matter to us. I, for one, want to give them a chance and see if they can do better. Then, we pray, hold THEM accountable, and hope they don't blow it!! Now, quit reading and go VOTE! !